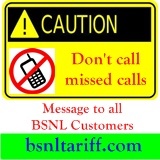 Home BSNL-Alert-Message bsnl-news Karnataka Telecom Circle Don't call to Missed calls which starts with...? Don't call to Missed calls which starts with...? Karnataka Telecom Circle (BSNL) has announced a important and caution message to convey to all its BSNL customers to get alert from missed calls coming from certain numbers which are starts with. +263 & +960. Calling to these malicious numbers may lead to charge at ISD rates. This message is issued by Karnataka Telecom Circle in the interest of its esteemed customers.